Martin Freeman Joins The Marvel Cinematic Universe, Who Will He Play? There’s one sure-fire way to improve your movie or television show: Cast Martin Freeman. So by this logic, Joe and Anthony Russo’s Captain America: Civil War just got better, because Marvel just revealed that Freeman has been added in a mysterious role. In a press release, Marvel notes that Martin Freeman, of Sherlock and Peter Jackson’s The Hobbit trilogy, has joined the cast of the third Captain America movie, which has begun filming in Atlanta. Marvel Studios President Kevin Feige talks about Freeman’s "range" in the announcement, and notes that Marvel couldn’t be more "honored or excited" to have the actor in the movie. But you know what Feige doesn’t tell us? Who Martin Freeman will PLAY in Captain America: Civil War! My best guess is that Martin Freeman will assume a supporting – possibly political – role, the kind occupied by the likes of Tommy Lee Jones or Robert Redford in the previous Captain America movies. Freeman’s not playing a superhero, or a villain. His casting wouldn’t be posted to Marvel.com casually if that were the case. One colleague already has suggested that Freeman could be cast as Henry Peter Gyrich, a government liaison who interacts with The Avengers, and eventually became a member of the Commission on Superhuman Activities… something we assume will have to be very popular in the Civil War storyline. It’s very possible Martin Freeman is playing a small role, something like Garry Shandling’s character in Iron Man 2 and, later, Captain America: The Winter Soldier. But let’s expand out minds a little and have some fun. What if Marvel cast Martin Freeman as Norman Osborn, and is putting him in place for possible use in the untitled Spider-Man movie for 2017? 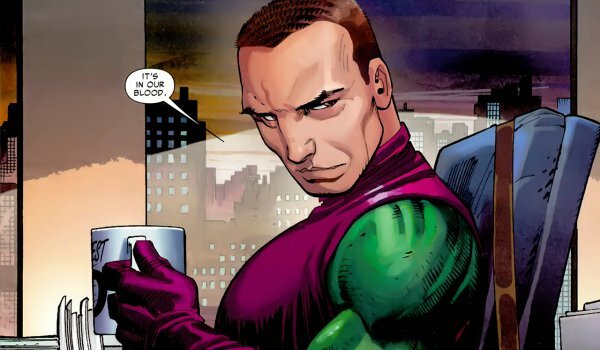 Norman Osborn played an unusual role in the Civil War storyline, leading up the government-sanctioned Thunderbolts, a team of villains hired to round up heroes who refused to register. (In a way, the act like the Suicide Squad… wouldn’t that be funny if the Thunderbolts were introduced the same year that DC tries to beef up its universe.) It would take a lot of set up on Marvel’s part – probably too much set up – to adhere to Norman’s traditional Civil War arc. But since we expect to see Spider-Man in Civil War, and Marvel now knows it needs to seed Spidey material ahead of the 2017 movie, it’s not that far-fetched to guess that Freeman’s role might have more implication than just a Senator of Congressman who sides with either Tony Stark or Steve Rogers.